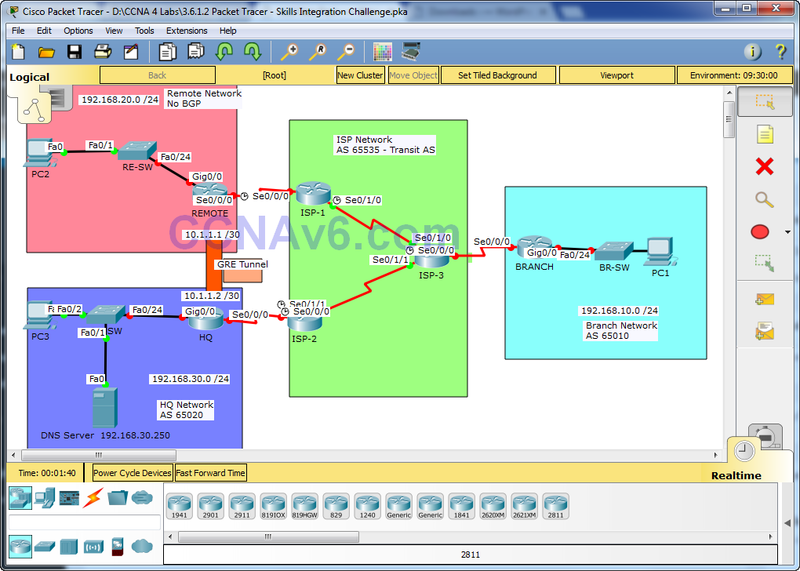 In this skills integration challenge, the XYZ Corporation uses a combination of eBGP, PPP, and GRE WAN connections. Other technologies include DHCP, default routing, OSPF for IPv4, and SSH configurations. Note: The user EXEC password is cisco and the privileged EXEC password is class. Configure interface addressing as needed on appropriate devices. Use the topology table to implement addressing on routers REMOTE, HQ, and BRANCH. Configure PC1 and PC3 to use DHCP. Set the modulus to 2048. The domain name is CISCO.com. The username is admin and the password is secureaccess. Only SSH should be allowed on the VTY lines. Configure the WAN link from BRANCH to the ISP-3 router using PPP encapsulation and CHAP authentication. Create a user ISP-3 with the password of cisco. Configure the WAN link from HQ to the ISP-2 router using PPP encapsulation and CHAP authentication. Create a user ISP-2 with the password of cisco. 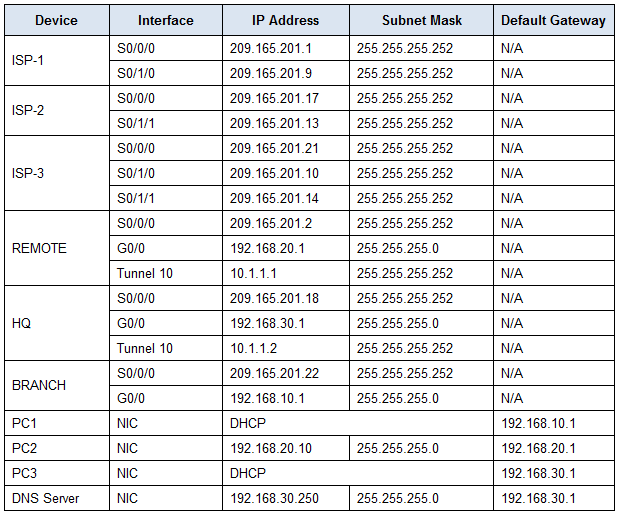 Exclude the first 5 IP addresses in the range. The case-sensitive pool name is LAN. Configure PC1 to use DHCP. Configure PC3 to use DHCP. Configure REMOTE with a default route to the ISP-1 router. Use the Next-Hop IP as an argument. Configure BRANCH with eBGP routing. Configure BRANCH to peer with ISP-3. Configure HQ with eBGP routing. Configure HQ to peer with ISP-2. Add HQ’s internal network to BGP. Configure REMOTE with a tunnel interface to send IP traffic over GRE to HQ. Configure Tunnel 10 with appropriate addressing information. Configure HQ with a tunnel interface to send IP traffic over GRE to REMOTE. Because the REMOTE LAN should have connectivity to the HQ LAN, configure OSPF across the GRE tunnel. Configure OSPF process 100 on the REMOTE router. REMOTE should advertise the LAN network via OSPF. REMOTE should be configured to form an adjacency with HQ over the GRE tunnel. Disable OSPF updates on appropriate interfaces. Because the HQ LAN should have connectivity to the REMOTE LAN, configure OSPF across the GRE tunnel. Configure OSPF process 100 on the HQ router. HQ should advertise the LAN network via OSPF. HQ should be configured to form an adjacency with REMOTE over the GRE tunnel. Verify full connectivity from PC2 to the DNS Server. Verify full connectivity from PC1 to the DNS Server.